1.Well, it wouldn’t have worked for any other actor or character. And upon second view, I’m not sure Robert Morse’s posthumous song-and-dance number entirely worked for me. But Morse has a storied background as a Broadway musical star who first came to prominence in 1961’s How to Succeed In Business Without Really Trying. He won a Tony Award as J. Pierrepont Finch, a window washer turned corporate master. Morse’s Mad Men character, ad agency patriarch Bertram Cooper, died off-camera on his living room couch after saying “Bravo” while watching the July 20, 1969 moon landing with his maid. Lest one think he’s overly egalitarian, Bert earlier upbraided that same maid for running the vacuum cleaner as this historic event began unfolding. He’s also the guy who demanded earlier this season that a black secretary figuratively be sent to the back of the bus after an office reshuffling made her the first person visitors would see upon arriving at Sterling, Cooper & Partners. Bert got a final curtain call seen only by Don Draper (Jon Hamm) in the closing minutes of Sunday’s episode. Underscoring the shared experience of watching Neil Armstrong become the first human to touch the moon’s surface, Bert/Morse sang out, “The moon belongs to everyone. The best things in life are free.” The performance included a little of the old soft shoe amid dancing girls while Don affixed a quizzical look. It brought down the curtain on the final season’s first 7-episode arc. Mad Men’s second act won’t start until next spring. “The Best Things In Life Are Free,” originally written in 1927, was the title song of a 1956 musical starring Gordon MacRae, Dan Dailey, Ernest Borgnine and Sheree North, who performed it on-screen via Eileen Wilson’s dubbed in voice. Bing Crosby, Frank Sinatra and many others also have covered the song. 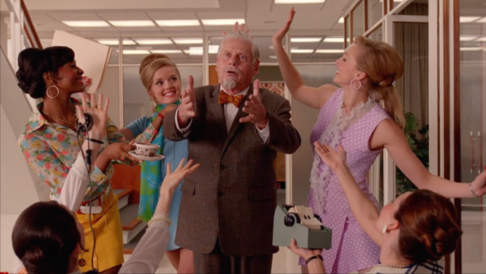 Mad Men episodes almost always end with music meant to amplify the closing scene or scenes. But this is the first time the series has gone full-blown out of body. No other cast member has anything close to the musical background of Morse. So depending on one’s tolerance, this particular indulgence by creator/executive producer Matthew Weiner can either be excused, frowned upon or applauded. Please, though, no more. This isn’t Cop Rock. 2. John Slattery’s Roger Sterling otherwise was the main mover and shaker, cutting a deal to save Don’s job in particular by allowing rival McCann Erickson to buy 51 percent of Sterling Cooper while the agency still kept its key players, clients and independence. Slattery was at his finest as a take-charge guy who finally had arch foe Jim Cutler (Harry Hamlin) dead to rights. “Well, I won’t do it,” Cutler sniffed. “That’s fine. Because you’re not of essence,” Roger retorted, flicking him off like a fly on a picnic basket. In the end, smarmy Cutler also raised his arm in assent. “It’s a lot of money,” he said of the big financial cuts the Sterling Cooper partners stood to reap. Hamlin has been excellent this season and fully merits a best guest actor Emmy nomination. 3. The “Waterloo” title came from Bert’s continued belief that Don didn’t really belong at Sterling Cooper anymore. Instead of referencing Thomas Wolfe’s You Can’t Go Home Again, Bert told Roger, “No man has ever come back from leave. Even Napoleon. He staged a coup. But he ended up back on that island” after being defeated at the Battle of Waterloo. “Don,” she said in a manner that snapped him out of it. “I’ll always take care of you,” he assured her. She said this tearfully, without rancor and in sharp contrast to first wife Betty Draper’s (January Jones) wholly dismissive response when asked by a woman friend whether she still sees Don. Pete Campbell (Vincent Kartheiser) then had the perfect capper, for him anyway, upon learning of the Don-Megan split on the flight to Indiana to secure the Burger Chef account. “Marriage is a racket,” he said, spitting out the last word. 5. Betty’s friend, Carolyn Glaspie, was played by Kellie Martin, whose cast regular credits include ABC’s Life Goes On, NBC’s ER and CBS’ Christy. It was her first appearance on Mad Men. Cronkite heard the first part, but “I didn’t get the second phase,” he told co-host and astronaut Wally Schirra. The word “supper” has long since become antiquated. And as noted in a previous Mad Men compilation, Burger Chef has long gone out of business. But families are still eating Kentucky Fried Chicken at the dinner table, making a homey hero of mom in a latter day TV ad. 9. More TV writers recap Mad Men on a weekly basis than any other current series. But where was the love from the national Television Critics Association (of which I’m a member and past president)? The TCA’s 30th annual awards nominations, released Tuesday, had nothing at all for Mad Men.